“Transparency in health care can be a powerful tool for ensuring patient safety. But, it is too often not taken into account when considering patient safety measures. As a result, serious mistakes may happen in hospital or at the doctor’s office, and no one can learn from them. Or, a medical device, such as an artificial joint may have a design defect, and few people will know not to use it. Click here to continue reading this JustCare post. Each week the Pennsylvania Department of Aging releases a Friday newsletter with information relevant to activities, issues and events for older Pennsylvanians and persons with disabilities across the Commonwealth. Click here to read the October 30 newsletter. 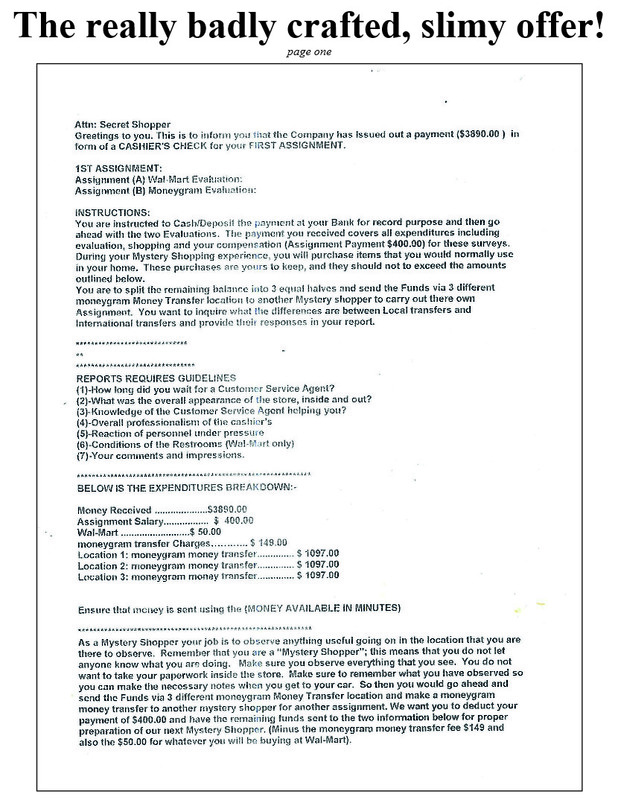 “Cornwall police are warning residents about a ‘mystery shopper’ scam that failed to ensnare a borough resident. 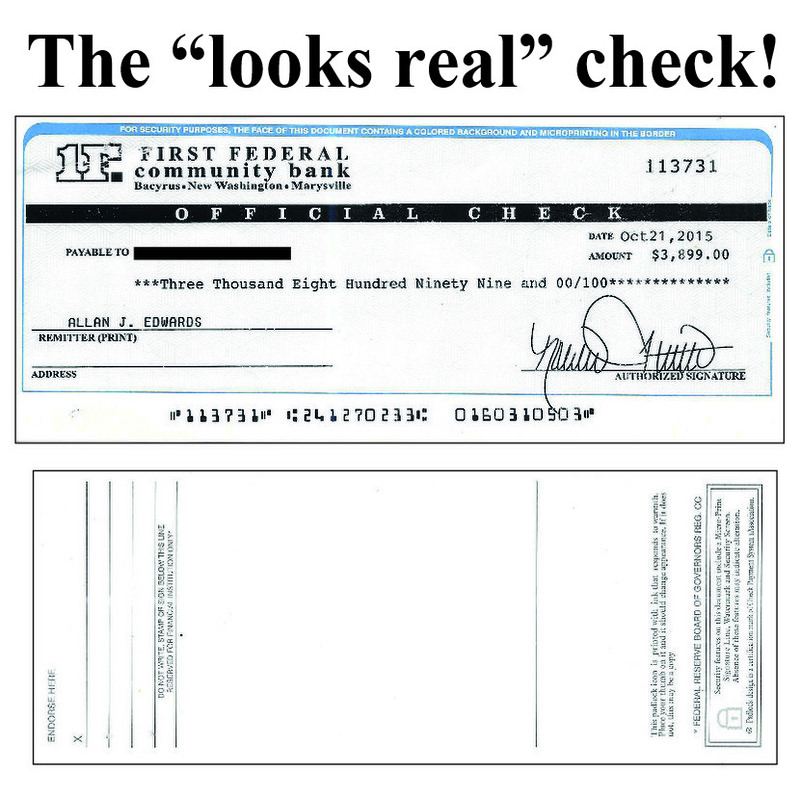 “The woman, who was not identified, received a packet of information and instructions containing an authentic-looking Capital One Bank cashier check in the amount of $2,550. The instructions directed the resident to cash the check, complete the mystery shopper duties at a local Wal-mart by purchasing up to $70 in merchandise and then wiring remaining funds totaling $2,230 to another mystery shopper, police said. Yesterday, someone gave us these documents that the person received in the mail on Wednesday; these are the elements of a SCAM. If you get one of these letters, or if you know someone who has, take the envelope and its contents to your local police department or to your local post office. 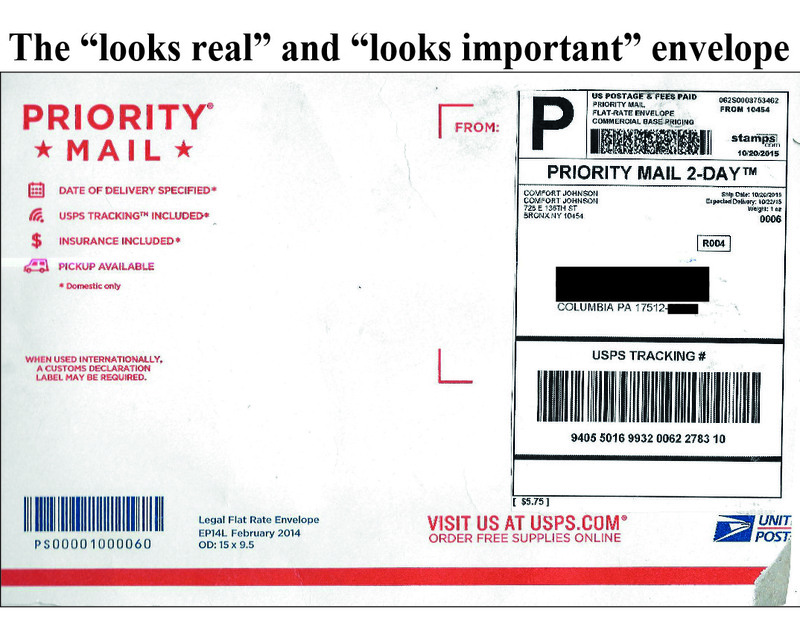 This is mail fraud. “Preying on the aging is gaining popularity. It’s easy to dismiss their actions as Alzheimer’s. What we can’t comprehend is that everyone ages differently. Once genetics can be perfected to encompass this fact of life, then we all will live better.” – comment following the article. This article / opinion column at Bloomberg View presents some challenging thoughts and concepts; the comments following the article are worth reading, too. The article begins: “Adult life is one long, sad tale of declining analytic capability and ability to remember things. I could tell you all about my personal experience with this, except that of course I’ve forgotten most of it.” Click here to read the Bloomberg View piece (and the comments) in its entirety. “One of the many questions midstate residents are asking about Walgreens’ planned acquisition of Rite Aid is this: What will happen to the money and volunteers that Rite Aid has traditionally provided to the region’s nonprofits? Click here to read the Central Penn Business Journal article in its entirety. 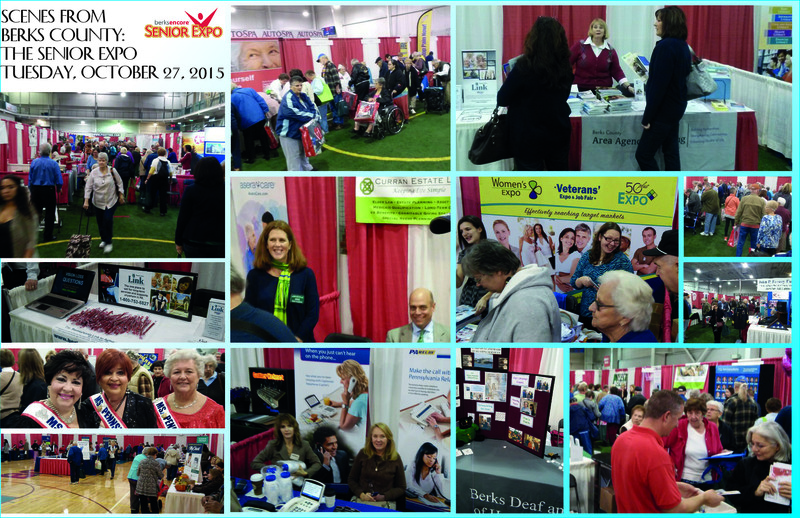 On Tuesday, October 27, thousands of Berks County seniors flowed into the BodyZone for the 15th annual Berks Encore Senior Expo. A number of Pennsylvania Link to Aging and Disability Resources’ partners from the Berks County partners’ network were on hand to share resources’ information with the expo visitors. 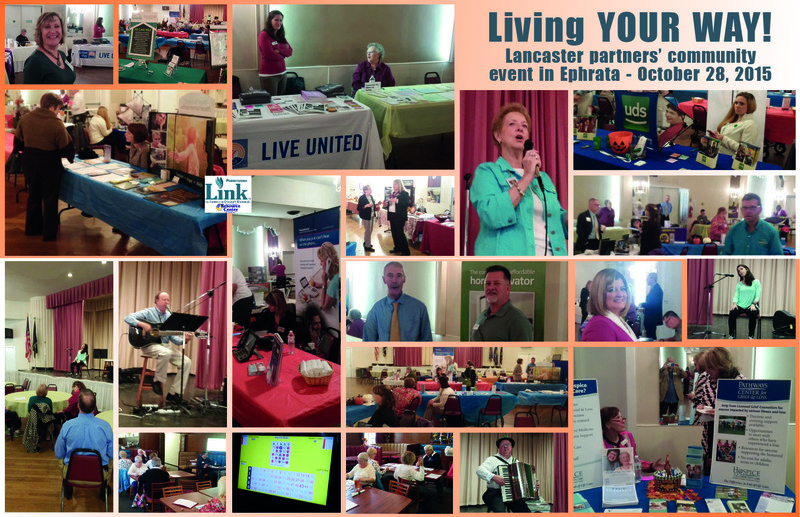 Meanwhile Lancaster County Link partners hosted the “Living YOUR WAY” event in Ephrata on a windy and wet Wednesday at the Ephrata American Legion. “GIVEN the tens of millions of people in retirement or about to enter it, it’s surprising how few plan for something most of them will eventually need: help doing basic tasks at home. But perhaps it is not so surprising: It’s like learning a difficult new language late in life. 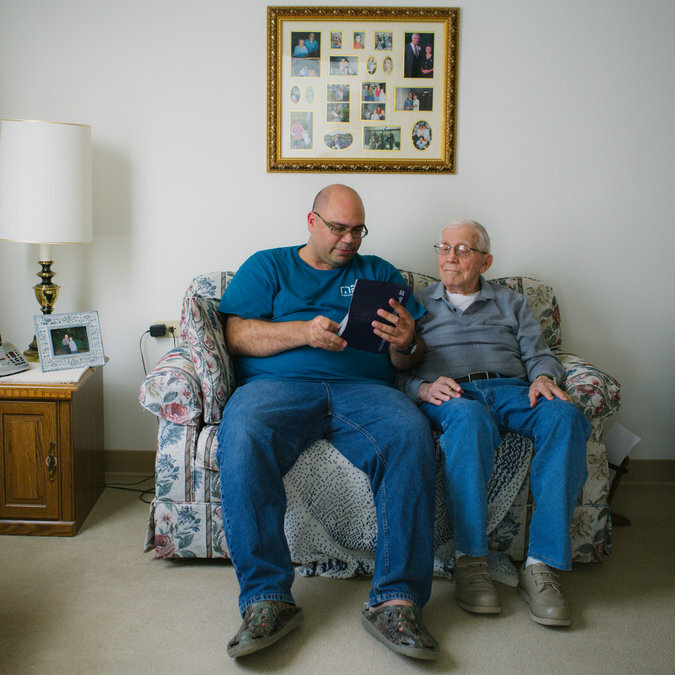 “Only about 1 percent of those aged 65 to 74 live in nursing homes, the Census Bureau reports. Most retirees continue to live at home as they age, even though many do not have relatives nearby to assist them as it becomes harder to handle daily activities because of declining health, mobility or cognitive difficulties. “Of those who need the help most, many won’t admit they need it or obtain assistance willingly on their own. They fear loss of independence and becoming a burden to their families. This is an issue I’m facing in my own family and it’s difficult to navigate. Click here to read the October 23 newsletter. “We just learned America’s rental affordability crisis is as bad as it’s ever been. Unfortunately, it’s about to get a whole lot worse. “The American Community Survey for 2014, released a few weeks ago, found that the number of renters paying 30% or more of their income on housing – the standard benchmark for what’s considered affordable – reached a new record high of 20.7 million households, up nearly a half-million from the year before. Despite the improving economy, the increase was nearly five times bigger than last year’s gain. The Assistive Technology Act of 1998 as amended (AT Act) provides for state assistive technology (AT) programs in each state and territory to improve access to and acquisition of assistive technology. Pennsylvania’s Initiative on Assistive Technology (PIAT), a program of the Institute on Disabilities at Temple University, is the Commonwealth’s “lead agency” for this work. The program receives its funding from the Administration on Community Living, US Department of Health and Human Services. PIAT has created an infrastructure of Assistive Technology Resource Centers (ATRCs) across the Commonwealth which, together with the “central office” at the Institute on Disabilities, are key to a seamless system of improved access to assistive technology for all Pennsylvanians with disabilities and older Pennsylvanians, regardless of where they live, their age, income, or type of disability. As per the AT Act and in collaboration with the Assistive Technology Advisory Council, key activities for implementation of the AT Act are described in the PA State Plan for Assistive Technology and approved by the Administration on Community Living. The reuse or reutilization of assistive devices is one of the priority “state level” activities required by the AT Act. Reutilization programs are solutions for individuals with disabilities who need items public sources will not pay for (including back up devices); need a device that is no longer manufactured; or have an acute need for a device while they pursue or wait for funding. Reutilization programs may include (1) refurbishment programs, where donated devices are cleaned, sanitized, repaired or otherwise “made ready” for new owners, (2) exchange programs, where individuals with devices to sell or donate advertise the device, and individuals in need of a device can look to see if the device they need is available and then contact the donor/seller to make the arrangements for sale and transfer of the device, (3) reassignment of new devices (e.g. from donations of excess stock from a supplier) and (4) open-ended loans where the consumer can continue to use the item until no longer needed (not recommended except in special circumstances). Reuse programs increase the ability of Pennsylvanians with disabilities and older Pennsylvanians who are unable to afford new items by offering devices that are in good working condition and are available at no or low cost. Through its federal funds, PIAT supports the Reused and Exchanged Equipment Partnership (REEP) On-line Classifieds, as well as reassignment and refurbishment programs implemented by ATRCs and other community-based organizations. These programs form the Pennsylvania REEP Network. PIAT is providing funding to enhance the scope of assistive technology reutilization available to people with disabilities in Pennsylvania. This competitive Request for Proposal is offered to develop new reuse programs, as well as to enhance existing ones. The total amount under this competitive RFP is $15,000, contingent upon availability of federal funds. PIAT intends to award three (3) grants at $4,000 each, and three (3) mini-grants at $1,000 each, for the nine-month period January 2016 – September 2016. Only proposals received by Pennsylvania’s Initiative on Assistive Technology, Institute on Disabilities at Temple University by the deadline of 3:00 P.M. Wednesday, November 25, 2015 will be eligible. Submit electronically to Jamie Arasz Prioli (Jamie.Prioli@temple.edu), with a copy to Yvette Bolden (bolden@temple.edu). Do not mail hard copies. Applications received after the deadline will be ineligible. Only applications containing all required materials will be considered. Description of the work plan, rationale, and means to accomplish the plan. The applicant agency has a proven track record of being consumer-responsive. The applicant agency has “not-for-profit” status in Pennsylvania. The applicant agency has been financially sound for the two preceding fiscal years. Each applicant agency must make the following assurances, to be implemented upon award. Additional assurances may be required as attachments to the contract. Materials (including web pages, PowerPoint, brochures) developed under this subcontract will acknowledge Pennsylvania’s Initiative on Assistive Technology, the Commonwealth’s Assistive Technology Act Program at the Institute on Disabilities, Temple University, funded through a grant from the Administration on Community Living, US Department of Health and Human Services. In all activities related to this work, the reuse program will identify itself as a part of Pennsylvania’s Initiative on Assistive Technology, the Commonwealth’s Assistive Technology Act Program. Funding received by the program under this RFP will be used to supplement, not supplant, amounts available from other sources for reutilization activities. The reuse program and services are available to Pennsylvanians of all ages, regardless of nature or degree of disability. The reuse program is housed in a building free from architectural and communication barriers. The reuse program has a working text telephone (TTY) and/or videophone on site. The reuse program will provide reasonable accommodations to meet the needs of individuals with disabilities seeking services of the program. Upon request, all materials will be available in a timely fashion in alternative formats (including Braille, accessible electronic text, etc.). The reuse program will comply with any otherwise applicable provisions of the Americans with Disabilities Act. The reuse program will comply with Section 508 of the Rehabilitation Act (access to electronic information technology). This includes the assurance of accessibility of the reuse program’s website. Describe how funds available through this agreement will be used to establish a reuse program. Describe the agency’s ability to pick up donations or deliver equipment to recipients of reuse activities. Identify and supply information on at least two voluntary organizations or programs that can assist in transporting devices within the ATRC region. Maintain a current description of the agency’s reuse program on the Pennsylvania 2-1-1 online database system and on the listing available at http://www.passitoncenter.org/reuse_results.php?state=PA. Describe the personnel assigned to accomplish the required activities. Attach resumes of key personnel to the response to this RFP (not included in the page limit). It is permissible to split functions among a variety of positions (e.g. program assistant manages the equipment sanitization; agency information and referral coordinator provides REEP listings) as long as these roles are fully described and job titles are identified in the RFP. However, one staff person must be identified as the “primary contact” for the implementation of program activities and one as back-up in the event the primary contact is on vacation or other extended time out of the office. Assure the agency will obtain performance measures and satisfaction from every individual who receives an AT device from its reutilization efforts. (Forms to be provided). By February 2, 2016, complete the Indicators of Quality for Assistive Technology Reuse (IQ-AT Reuse) survey, an interactive tool of quality indicators that looks at “promising practices” in the area of assistive technology reuse: http://passitoncenter.org/IQATReuse. Describe the program’s plan to sustain (fund) its efforts under this initiative, after the funds provided under this RFP are exhausted. There is no guarantee that these funds will be available in subsequent years. The data elements required by the Administration on Community Living are federally determined and are reflected in the data collection worksheets. Data collection forms will be supplied upon award. All data is due MONTHLY by the 7th of the following month (i.e. January 2016 report is due by February 7, 2016). Data must be entered in the PIAT database by awardees with existing access. Paper reports must be submitted electronically to Jamie.Prioli@temple.edu and cc’d to bolden@temple.edu. Programs are required to include at least one anecdotal story in the monthly report. Each story should describe how the AT and the AT reuse made a difference for the person with a disability, whether in the community, at work, or at school. If necessary, the report should explain why there is no story that month. A program report summarizing the program’s progress in accordance with its work statement shall be submitted for the first five months of the year (January 1, 2016 –May 31, 2016), due June 30, 2016, using the form provided. A final report summarizing the entire nine months of project activities is due October 31, 2016, using the report form to be provided. Any activities NOT COMPLETED must be identified in the final report and a plan proposed for their completion, at no additional cost. All invoices must be submitted electronically to Jamie Arasz Prioli at Jamie.Prioli@temple.edu and cc’d to bolden@temple.edu. These reports should follow the line-item budget format and indicate grant-related expenses for the period covered. Back up documentation must be provided (e.g. receipts for cleaning and sanitizing supplies). Payment may be withheld based on failure to provide reports/data entry on the required schedule. Payments may also be withheld when requests for clarification of the five-month report or description of plans for remedial action are not provided in a timely fashion. The budget for the proposal must be approved and will be filed as part of the agency’s contract with the Institute on Disabilities. Both a budget summary (line item budget) and a budget narrative are required. The budget must show the details of how the total federal grant funds will be spent so that, if approved, every item of expenditure may be compared with the spending plan. Budgets must show 100% of proposed project cost, including funds from other sources and in-kind contributions (if any) by the applicant agency. Examples of in-kind contributions are a percentage of time not funded by this project that personnel will work on these program activities, a percentage of rent, donated equipment or supplies, etc. Line item budget and budget narrative do not count toward the page limit for the RFP submission. The following costs are not allowable: charges for indirect costs or administrative overhead; audit; space rental; and equipment. Personnel List personnel by job title/s for the project and indicate the full time equivalence (FTE) of hours/week to be spent on the project by each job title. Based on the FTE, identify the salary cost for each position, including the amount requested and/or provided as a match for the project. For example, if a fulltime employee works 10 hours/week on the program, and the agency’s typical work week is 40 hours, the employee should be described as “25% FTE”. If a part-time employee works 10 hours/week on the program, and that is the only work he or she does for the agency, it is still 25% FTE. If the part-time employee works 10 hours/week for the agency, and 4 hours a week is spent on PIAT-related activities, that employee should be described as 10% FTE. Please note: if there are staffing changes in key personnel, the reuse program must notify PIAT within 10 business days, and upon new staffing, provide contact information and resume. Fringe Identify the fringe rate and total amount requested and/or provided as in-kind. Describe the basis for fringe. For fringe rates exceeding 35%, explain the reason for the high rate. Travel This category covers the cost of in-state travel by staff in order to perform project activities. Provide an explanation of how these costs were derived, including mileage and other reimbursement rates as per the agency’s travel reimbursement policies. Supplies These are items which are used or expended when put to use or which have an expected service life of one year or less. In the budget narrative major categories such as office supplies, cleaning supplies, etc. should be used. Postage Costs related to postal service such as stamps, metered postage, and registered mail are included in this category. Telephone Usage costs for the operation of telephones are allowable in this category. Because applicants are required to have electronic mail capability, telecommunications costs related to Internet access are allowed in this line. Printing Costs under this category may be used for the development of brochures, manuals, reports, and the reproduction of such items. Space Rental: Space rental and custodial maintenance costs are not subject to payment. However, the pro rata cost of these services for the project may be included as an in-kind contribution. Equipment: Purchase or lease of equipment needed to carry out the work may be reflected as an in-kind contribution. The deadline for submitting applications under this RFP is 3:00 p.m. November 25, 2015. PIAT prefers e-mail submissions, sent to JAMIE.PRIOLI@TEMPLE.EDU. PIAT will accept mail and overnight mail submissions provided that an accessible electronic copy is submitted as well. The awards for this activity will be announced December 15, 2015 with work to begin on January 1, 2016 and end on September 30, 2016.